This range of Clean O Graders Machine is very effective in cleaning & grading spice- seeds, grains, pulses and other food grains. Both cleaning & grading functions are combined in a single unit which is enabled by Sturdy tubular frame construction to support the whole cleaner unit. An eccentric drive management is dynamically balanced which ensures vibration free reciprocating motion. Scalping deck plus two cleaning decks to suit specific process requirement. Optionally, 3 decks can be provided for grading of material, as required. Totally closed cleaner shoe with easily replaceable sieve panels. Ball decks provided for efficient sieve cleaning. Feed hopper with material flow control gate. Pre-aspirator with air control to remove light air-borne impurities and dust before feeding on deck. Post-aspirator with air control to regulate the removal of light particles from the final product. Large size inspection windows provided on post-aspirator, to facilitate precise air control adjustment while viewing actual working in aspiration channel. Aspirated impurities collected in one expansion chamber and discharged through screw conveyor. Optionally two expansion chambers available for collection of pre-aspirated and post-aspirated materials separately. Aspirated dust collected in cyclone and air discharged through the fan. Dust collector cyclone & fan can be located away from cleaner to suit site condition. Modern fine Cleaner with grading decks, most suited for spice seeds & grains. Pre and Post aspiration system with collection chamber & cyclone ensures dust free working in the plant. Controls of feed facilitate finer grading of products of several varieties. Controls of air allow suction of lighter impurities/seeds as desired. 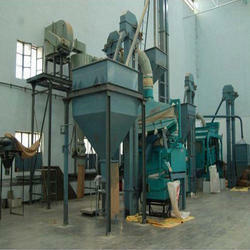 We are leading manufacturer and supplier of Spice Seed Cleaning and Grading Plant. Some of the noticeable benefits provided by these processing plants include allowing round-the-clock production throughout the year, suitability for processing of all types of pulses. Beans Processing Machine offered comes designed and developed using latest technology support so as to provide for consistent working as demanded by the customers. 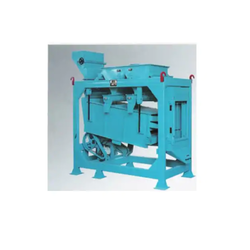 Further, these processing machines are of a universal type and can efficiently meet the demands of cleaning most kinds of beans just by changing sieves according to the size of beans. Comes with cyclone dust separator for environment-friendly usage. Suitable for efficient cleaning and grading of seeds. Perfectly support the demands of removing straws and other light impurities. Grading function for removing large and small impurities at same time. All oversize and undersize impurities are discharged from outlets. 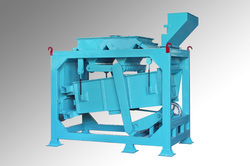 We are leading manufacturer and exporter of Pulse Grading Machine. We are leading manufacturer and supplier of Seed Grader. Application Seeds, Cereal Grains, Beans, Melon Seeds, Oil Seeds, Garden Seeds etc. We offer Seed Cleaning Grading Plant to our clients. Supported by an experienced team of professionals and trained workforce, we offer effective solutions for turnkey projects conducted in various industrial plants. We provide design, manufacture, installation, erection, and commissioning of plants and bulk material handling equipment on turnkey basis. Oil seeds Pre-cleaning/cleaning equipment for any oil seeds capacity ranging up to 60 TPH. Destoner for any oil seeds/dry granular material, capacity ranging up to 15 TPH. Material handling equipment likes Bucket Elevators, Screw conveyor, Belt conveyor, Redler / Drag Conveyor, Roller Conveyor, Apron conveyor, Rotolift etc. ranging up to 120 TPH Capacity. Oil seeds preparatory for oil mill, Sunflower/Neem seed/Palm nuts Cleaning, De hulling (Upper Skin removing) and Hulls Separation plant. Spices processing plant/whole spice seeds cleaning and grading plant. Soya bean Preparatory Plants for Cleaning, Grading, Cracking and Hull Separation for Edible Soy Flour The company has earned the name in these fields by serving esteem organizations all over India and abroad also.